This bath recipe using Rose Geranium (pelargonium roseum). Rose geranium has a floral scent similar to that of the geranium, but with a slightly rosy hint. It may be used in the aromatherapy treatment of acne, cellulite, dull skin, lice, menopause, and oily skin. 4 tbsp. finely ground rose flowers. Add the rose geranium essential oil to the dendritic salt , Blend well until the aromatic oil was absorb by the dendritic salt. Please use a large bowl to mix it. Simply place rose flowers to the blender and whirl until they are powdered,or you could just put them in the blend. Gently fold the flowers to the blend. Note: Please use a stainless steel bowl or glass mixing bowl to blend the ingredient. To use: the bath salt ½ cup or 1 cup to your bath water. Tips: If you dont want this dried herb to clog your drain , you can use a drain catcher to collect all the dried herb or put the herb in loose weave fabric, organza bags, or cheesecloth and tie them and put in your tub. Bath salt color will fade eventually, direct sunlight or light can fade the color quickly, so please store them in a cool, dark place. 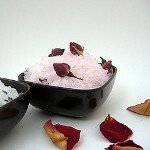 What is Aromatherapy Bath Salt? - Many believe that the relaxing properties of warm water, well chosen bath salts and essential oils can provide relief from unpleasant conditions such as anxiety and stress.